The solemn services in honor of Christ's Resurrection begin at midnight in the Greek Church. The priest and all the congregation, lighted candles in hand, leave the church by a side door after the vigil of Easter. The procession walks around to the main door, which has been closed (representing the sealed tomb of Christ). The priest slowly makes the sign of the cross with the crucifix he holds in his right hand. At this moment the doors swing open, the people intone the hymn, "Christ Is Risen," all the church bells start pealing, and the jubilant procession moves into the brightly illuminated church. The candles in the hands of the worshipers fill the building with a sea of sparkling lights. 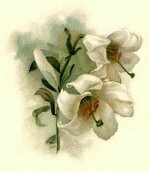 The Matins of Easter are then sung, and the Holy Sacrifice of the Mass, at which all present receive Communion, is celebrated. After Mass the solemn Easter blessing is bestowed upon the food brought by each family. Nobody would think of eating unblessed food at Easter. In the cities of Russia this blessing used to be held outside the church. People would pile the food on tables, around their Easter cakes; each cake bore a lighted taper. The priests in their resplendent robes, accompanied by assistants, passed in procession beside the waiting multitude, blessing the food and the people as bells rang and the church choir intoned joyous Easter hymns. In the Latin Church there are no special ceremonies other than the Mass itself, which is celebrated in all churches with festive splendor and great solemnity. Of particular historical interest is the liturgical sequence (hymn after the Gradual of the Mass). The sequences originated in the tenth century as Latin texts to be substituted for the long-drawn final "a" of the alleluia which is sung at the end of the Gradual. The sequence of Easter Sunday, Victimae Paschali Laudes (Praise to the Paschal Victim) was written by the priest Wipo (about 1030), court chaplain of Emperor Conrad. It soon became part of the official text of the Easter Mass and is sung or recited in all Catholic churches every day during Easter Week. Tell us, Maria, what didst thou see on thy way? The winding-sheet and the linen cloths. Christ, my Hope, is risen! He precedes you into Galilee. Now we truly know that Christ is risen from the dead. Thou, Victor, Savior-King, have mercy on us. The words of Wipo's text were soon amplified by other phrases from the Bible; and the appealing play was eventually presented with appropriate devotion before the shrine of the Sepulcher on Easter Sunday morning. It was called "The Visit to the Tomb" (Visitatio sepulcri). In front of the shrine, now empty (the cross or Blessed Sacrament having been removed), the clergy played the scene of the Gospel that tells of the visit of the holy women to the tomb on Sunday morning. 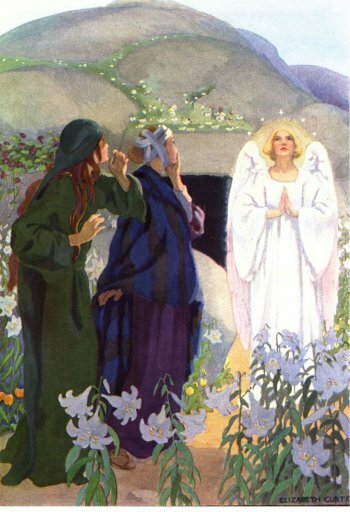 Two young clerics in white gowns, who sat or stood at the shrine, represented the angels and pronounced the Easter message at the end of the play: "He is not here, He is risen as He foretold. Go, tell His disciples that He is risen. Alleluia."